Polhill (1981a, h & i) recognised Galegeae and Carmichaelieae as distinct tribes. Within the Galegeae he distinguished four subtribes: Coluteinae, Astragalinae, Galeginae and Glycyrrhizinae. Polhill (1994) added a fifth subtribe Alhagiinae. More recent studies suggest that the Carmichaelieae are best treated as another subtribe within Galegeae, and this is followed here. However, these studies also point strongly to the polyphyly of Galegeae (Wagstaff et al., 1999; Wojciechowski et al., 2000; 2004). Polhill’s concept of Galegeae appears to be in the process of disintegration into a number of smaller tribes, but decisions on this would be premature until constituent taxa are sampled more comprehensively, and putative monophyletic groups can be substantiated by morphological and other systematic data. Glycyrrhizinae Rydb. was recognised by Polhill (1981h) as very distinct, but he left it as ‘an outlying subtribe of Galegeae’. Molecular analyses have confirmed the outlying position of Glycyrrhiza (Fig. 53). Although it is a member of the Inverted Repeat Lacking Clade (IRLC), it forms a basal grade or sister group, along with such woody millettioid genera as Callerya and Wisteria, to the whole of the rest of the IRLC (Sanderson & Liston, 1995; Wojciechowski et al., 2000; 2004). Galeginae, containing the single genus Galega (Fig. 53), is also isolated from the rest of ‘Galegeae’. In Wojciechowski et al. (2000), it falls near the base of their Vicioid clade (Fig. 53) and is sister to the Cicereae. In Wojciechowski et al. (2004), Galega is sister to a combined Cicereae-Trifolieae-Fabeae clade, although with relatively poor support. Such placements have not been suggested before and careful morphological studies are needed to see if they support the relationships suggested by molecular analyses. One of the prominent features of Cicereae is the craspedodromous venation of the leaflets and while the leaflet venation in Galega is not truly craspedodromous, Polhill (1981h) does give ‘leaflet-nerves to margin or nearly so’ as one of the characteristics of Galeginae. Astragalinae contains, inter alia, what is probably the largest genus of flowering plants — Astragalus — with 2300–2500 species. Wojciechowski et al. (1999; 2000) have shown that their Astragalean clade (Fig. 53) is itself made up of several distinct clades. The first of these includes the vast majority of the species of Astragalus. Wojciechowski et al. (1999) and Kazempour Osaloo et al. (2003) find good support for Astragalus sens. strict. as a monophyletic group, i.e., excluding only a very few outlying species (mentioned below). Wojciechowski et al. (1999) also showed that genera such as Oxytropis, Sutherlandia and Swainsona, which are morphologically very similar to Astragalus (although they have never been formally combined within it), are in fact distinct and not nested within Astragalus. Sanderson & Liston (1995) and Wojciechowski et al. (1999, and references therein) have clearly shown that the vast majority of New World Astragalus form a single clade in which most of the species have chromosome numbers in an aneuploid series: n = 11, 12, 13, 14 or 15 (Spellenberg, 1976). The Old World taxa, on the other hand, have chromosome numbers that are euploid: n = 8, 16, 32 etc., and polyploids are common (Spellenberg, 1976). All the studies of Liston and his group (e.g., Liston & Wheeler, 1994) demonstrate that Astragalus, far from being a taxonomic ragbag, does in fact form a monophyletic group in which speciation has been particularly active; possible mechanisms have been discussed by Barneby (1964) and Polhill (1981h). A second small clade, sister to Astragalus, includes Biserrula pelecinus L. and Astragalus epiglottis L. These are both annuals of the Mediterranean Basin and N Africa. Both have only five fertile anthers and dorsiventrally compressed pods. The position of Biserrula has long been disputed but it has often been regarded as no more distinct from Astragalus than some of the other monotypic genera that have from time to time been split off, usually on account of their distinctive pods (Barneby 1964: 26). The position of Biserrula at the base of the Astragalus clade (e.g., in Wojciechowski et al., 1999, 2001; Kazempour Osaloo et al., 2003), however, supports its current treatment as a separate genus. Astragalus epiglottis, however, does not seem to have been treated anywhere above sectional rank. The third clade (Fig. 53) within the Astragalean clade of Wojciechowski et al. (1999; 2001), i.e., the Coluteoid clade, contains much of Polhill’s (1981h) Coluteinae, plus Astragalus sinicus L. and A. complanatus Bunge and the Southern Hemisphere carmichaelioid group. The group has a very scattered distribution, with the two Astragalus species occurring in E Asia, Lessertia and Sutherlandia in southern Africa, the carmichaelioids (including Swainsona) in Australia and New Zealand, Colutea widespread in continental Eurasia and NE Africa, and various smaller genera such as Smirnowia and Eremosparton restricted to C Asia. Wojciechowski et al. (1999) point out that Astragalus sinicus and A. complanatus resemble other Coluteinae in possessing non-interlocking wing and keel petals and a ciliate style (Lavin & Delgado, 1990). However, they also note that Wenniger (1991) has found stylar hairs to be quite widely scattered among sections of Old World Astragalus, and suggest that the character may have arisen several times. Kazempour Osaloo et al. (2003) found that Astragalus vogelii (Webb) Bornm., from N Africa, Arabia, W Asia, Pakistan and India, grouped with Colutea in their analyses, and they erected a new genus Podlechiella Maassoumi & Kazempour Osaloo (p. 22) to account for this species. This decision appears premature before detailed molecular analyses of the Coluteinae are available, and it is not accepted here. The genera separated as Carmichaelieae by Polhill (1981i) also appear best placed in this clade (Heenan, 1998a; Wagstaff et al., 1999). They have been shown to form a monophyletic group, confined to Australia and New Zealand. The fourth clade (Fig. 53), is made up of a monophyletic and distinct Oxytropis. The isolation of Oxytropis is reassuring but somewhat surprising as members of the genus are often morphologically extremely similar to species of Astragalus and can only be distinguished by the pointed keel petals and by the pod septum that arises from the adaxial suture, not the abaxial as in Astragalus. Species of Oxytropis are widespread in the north temperate regions, often on mountains. Three further groups of genera, exemplified by a) Erophaca baetica Boiss. (=Astragalus lusitanicus Lam. ); b) Chesneya plus Gueldenstaedtia and c) Caragana, Calophaca and Halimodendron, are sister either to the Astragalean clade, or to the Astragalean plus Vicioid clade (Wojciechowski et al., 2000). Relatively poor sampling within these groups has resulted in different analyses suggesting different divisions and placements. Some of the genera are poorly known and of restricted distribution (e.g., Oreophysa and Tibetia), but others are more widespread, including Chesneya and Gueldenstaedtia. 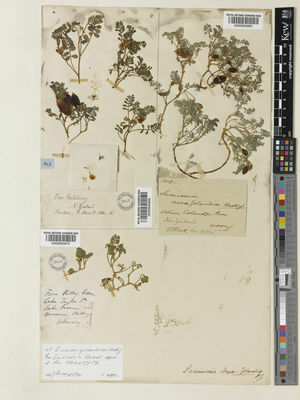 Erophaca baetica, together with Chesneya and Gueldenstaedtia (note that G. himalaica Baker, the exemplar of the genus in the supertree, is now placed in Tibetia) are part of the sister group to the Astragalean clade (Wojciechowski et al., 2001). Caragana, Calophaca and Halimodendron, on the other hand, form a monophyletic group sister to the Hedysaroid clade, and are here placed in Hedysareae. Sanderson & Wojciechowski (1996) and Wojciechowski et al. (2000; 2004) show that Alhagi appears to be best placed in Hedysareae, in agreement with Hutchinson (1964). In a tribe that is so clearly polyphyletic it is difficult to know how to arrange the constituent genera. For the purposes of this book, genera recognised in the tribe largely follow Polhill (1981h; 1994), although with modifications resulting from more recent research. The two major realignments since Polhill (1994) are the transfer of the genera mentioned above to the Hedysareae and the inclusion of the Carmichaelieae (Polhill, 1981i) within Galegeae. The arrangement of genera in this treatment is that suggested by the supertree of Wojciechowski et al. (2001). Not all genera have been sampled; genera not represented in the supertree have been intercalated in positions that appear to be appropriate from other data in, e.g., Polhill (1981h). Likewise, with the exception of Astragalus lusitanicus, here treated as Erophaca, the isolated species of Astragalus revealed by the supertree have not been treated separately. Podlech’s (1994) placement of three isolated Astragalus species as genera (Biserrula, Ophiocarpus and Barnebyella) has been followed here. Although we have suggested that it is premature to re-circumscribe tribal limits in this group, the bulk of taxa (i.e., those comprising Polhill’s subtribes Astragalinae [for the most part] and Coluteinae, and tribe Carmichaelieae), are likely to become recognised as a more narrowly defined tribe Astragaleae. As treated here the Galegeae sens. lat. comprises 24 genera and (2880)–3030–(3180) species.